Deschutes Jubelale is a traditional wintertime favorite on our block of Main Street. We all feel like we're on a first name basis with the beer, and we tend to just call it "Jubel". But in the Deschutes pantheon, that name is reserved for their once-a-decade doubled version of Jubelale, bottled ten years ago as Jubel 2000, and again this year as Jubel 2010. I went down to the Portland pub Friday for the release, and met Ritch and Brian there. 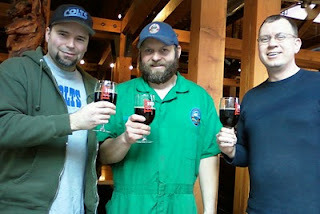 They're showing off their commemorative glasses of 2010 with Cam O'Connor, the head brewer here in Portland. Chalk up another win for Deschutes' double-recipe trick, also used to great success with Mirror Mirror, Double Black Butte, and Double Cinder Cone. This 10% beer is amazingly smooth and balanced. Swirl it in your glass and you get a great whiff of malt. The taste is indeed something like a concentrated Jubelale, but the Christmas spice flavors are replaced in this version with a soft cherry note. The taste was very familiar to me, so I asked Brian what beer it reminded him of, and he instantly responded "Hair of the Dog Adam". I think he hit it right on the head: this has the darkness and strength of Adam, and the hint of cherry calls to mind last year's wonderful Cherry Adam. I remember having Super Jubel last winter ('08-'09) at the Portland pub, and finding it a bit harsh. Jubel 2010 has been aged in Pinot Noir barrels for 13 months, so perhaps what I had a year ago was just too green (or if last year's was also aged for a year, then Deschutes really hit a home run with this year's batch). Cam reported that they made 500 barrels of Jubel 2010 -- for comparison, this year's run of Abyss was 700 barrels -- so you'll want to grab a couple of the 22-ounce wife-proofed wax-dipped bottles as soon as you can. They're $12 at the Portland pub. Your next chance will be in 2020.